East Coast Region or the ECR part of India is something of which every countryman can feel proud of. Not only the climate is a soothing one but the locale and environment of the region is such that you’ll feel like coming back there yet again. With the passage of time and the rise in the tourism industry, many new hotels and resorts have shown a mushroom growth. So, if you are planning to spend your next summer vacation with your children in Chennai and it’s surroundings, please make sure you live in a good hotel. And guess what, Hotel Mamalla Heritage is one of the finest hotels present in the capital of Tamil Nadu. When you are away from home, you must be expecting a place where comfort is guaranteed, and the room you are living in must be clean and hygienic with the air-conditioner. Hotel Mamalla Heritage fulfills all these expectations of yours which is very rare among the hotels in Mahabalipuram ECR Chennai. An ideal hotel, these days, must consist of a swimming pool above anything else. The swimming pool will enable your kids to have fun at some morning when you’d want to have fun without stepping out of the hotel. The swimming pool in Mamalla Heritage is filled with clear and blue water with even swimming instructor being available. Complimentary breakfast is something which doesn’t require any special mentioning in the advertisements of hotel these days. What makes Mamalla Heritage different from others is that not every hotel serves the breakfast in Bed. Tourists are an asset. Keeping them happy is a hotelier’s job. Mamalla Heritage serves breakfast in Bed if the tourists ask to do so. Most of the rooms in Hotel Mamalla Heritage offer a view of sunrise. So, choosing Mamalla Heritage over others will gift you with a scenic moment of the sunrise which very rare among the hotels in Chennai or Mahabalipuram in ECR. Chennai and its surroundings are something that dates back it’s origin to the ancient period of Indian history. Right from Chennai, you can travel to UNESCO heritage site Mahabalipuram, which is nothing less than a trail to history. Cars, buses, and other mediums are provided along with guides are available right at a distance of your phone call as Mamalla Heritage have their own conducted tours for their tourists. Adventure sports are something which entices the young generation more than anything else. Mamalla Heritage arranges its tourists for wave surfing to take the real feel of the Bay of Bengal along with the fulfillment of the desire for adventure sports in the sea. Hospitality towards tourists must be any hotel’s priority. Mamalla Heritage is nothing different than others in this aspect. Tourists are always the priority for Mamalla Heritage and ensuring that they have a comfortable stay and leave with smiling faces is always the main objective of Mamalla Heritage. 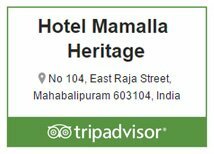 The tourists are ensured a happy stay at Hotel Mamalla Heritage, Chennai. Hope we’ll receive your phone call soon.